Significant changes are ahead for the armies of Saxe-Bearstein and those vile Stagonians. These armies are composed of Great Northern War and War of Spanish Succession Bloodaxe Miniatures which I purchased from sculptor Lance Runolfsson well over 20 years ago. I recently learned that he had sold his moulds to Historifigs. And today I got an email from Mike at Historifigs that he had finished casting some much-needed figures that I have long wanted. Beside ordering more musketeers, I will be receiving both WSS and GNW Grenadier figures (seen at left). While Lance's figures appear rough in their lead state, they paint up very easily and look good on the table top (at least to me). (You can see some in the masthead photo). While it will force me to re-paint some figures, the Grenadiers will allow me to paint my standard battalions of 24 men with six 40mm square bases of four figures -- one stand of which will be Grenadiers who can be detached to form a unit of combined grenadiers in each brigade. I will also receive some figures to build two more "irregular" units (each army already has one, but this will double it). These are also based four to a stand . . . but on the larger "cavalry" stands (nominally 50mm square but mine are actually 47mm square so that they will fit in my display cabinet). These are based in a loose diamond formation of 1-2-1. Speaking of Cavalry stands, I should also receive enough Hussars to add another regiment to each army. Cavalry units have six bases of two horses each. Once I've finished with this, I will be able to play out all of the "mini-campaigns" that folks submitted using various Charles Stewart Grant "Scenarios" and "Table Top Teasers". Well, that's the plan anyway. Now, when do we get together to paint? It will be a while. The figures haven't been shipped yet . . . and that will take some time. Also I've got both some oral surgery and cataract surgery coming up . . . and I'm not sure just when those will be scheduled . . . nor how long they will keep me from doing things. But we will get to do some painting. Count on it. I just don't know when. Looking eagerly forward to discover the renewed armies: cheers! Good plan. May I make a suggestion? 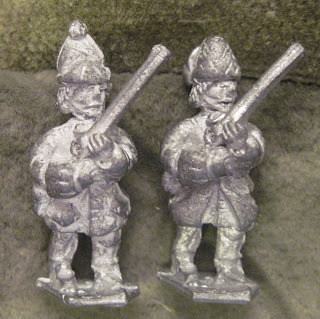 Why not add a group of what the Prussians would call "standing grenadier battalions." This would serve as elite shock troops or a bodyguard for the ruler. They could have superior fighting skills or be simply decorative. That would be up to you. But it would give you something really cool to paint. Much success on your upcoming surgeries.